ORDERING INSTRUCTIONS: If both blanks and imprinted leaves are needed, submit blanks to cart first. Then, go back and order imprinted leaves. Leaf size 1-3/4" x 3-1/2"
Our freestyle french curve leaf was made for those organizations that want to make their own donor recognition or memorial tree, (this is also the same leaf used on our Expanding Solo Leaf Tree - Samara Series.) If you are able to provide your own tree trunk and branches, then this leaf may be the one for you! Or utilize a local artist by painting a mural on the wall and place our "freestyle" leaves within the mural. Each leaf measures 1-3/4" x 3-1/2" and screws to a clear 1/4" thick acrylic backer plate that measures approximately 2-1/4" x 4". By mounting the acrylic backers to the wall with our screws and anchors provided, you can remove and install leaves easily and effortlessly. 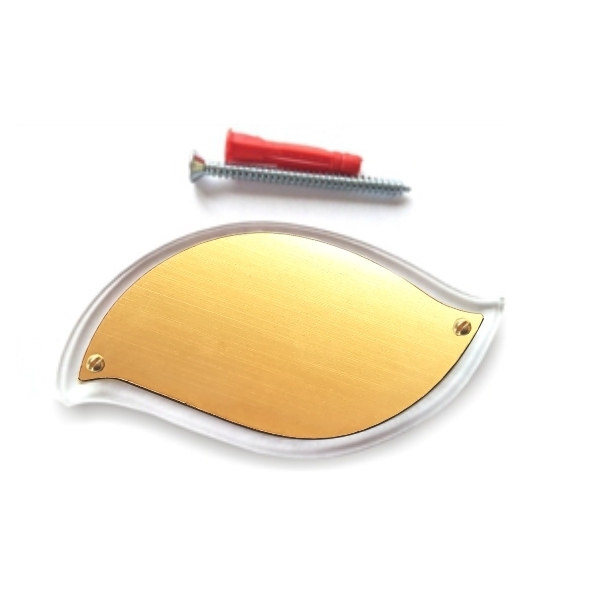 Each acrylic backer has 2 tapped and threaded holes to accept the small brass screws for leaf mounting. In addition, the acrylic backers have a center countersunk hole used to mount your backer to either a sheetrock (drywall) or brick wall using our furnished plastic anchor. If you wish, you can mount the acrylic backers to drywall using double faced tape instead of the screw and anchor (tape not provided). *POLYMER leaves available in brushed gold, brushed silver, brushed copper, brushed bronze and verde green.